If you are looking for my Growing in Unity post, go here. If you are looking for my Crafty Items Sale post, go here. Check out my giveaway on Instagram here. Good morning, friends! 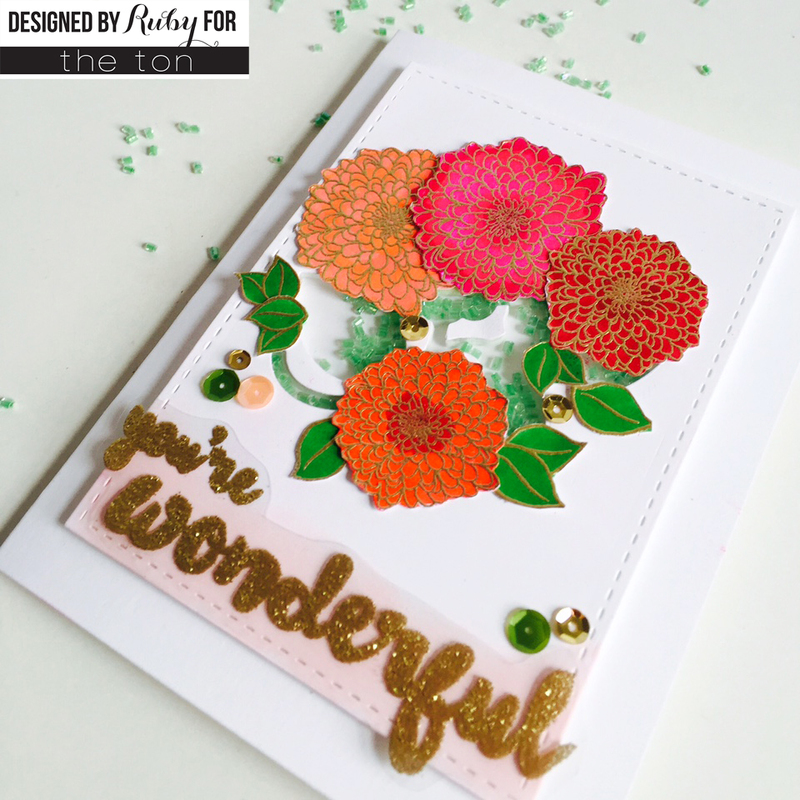 The Ton is having a mid-summer release today with some fabulous and unique gilding along with coordinating dies for three of our earlier stamp sets: Fresh Cut Peonies, Panda Can’t Even, and Simple Florals. Shop for the latest release on the site. You MUST check out the Crystal Embellishments, Beads, and Gems! You can find much more details by visiting The Ton Blog or follow us on Instagram, Facebook, Pinterest, or Twitter for updates. Did you know we also have a Flickr group? Be sure to link your projects that use The Ton products! The other design team members have created some stunners! You can visit Jessica and Mayline on their blogs. I have three cards to show off today. I’ll start off with my simplest card. This card was actually inspired by the most recent Runway Inspired Challenge: #87 Holly Fulton. 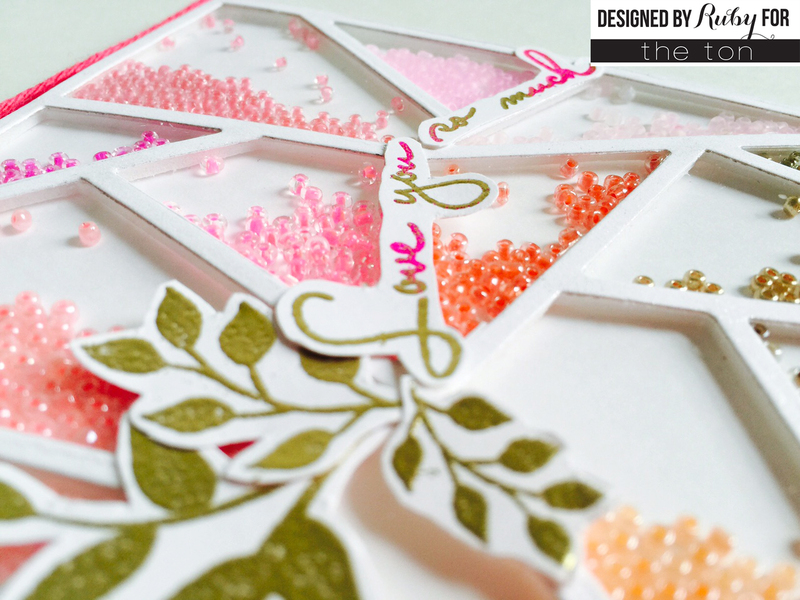 I die-cut a square using the second frame in MFT’s Die-namics Square Frames and Papertrey Ink’s Spring Rain cardstock. I attached it to the center of white cardstock with foam tape. I glued down the Flourish Embellishment with Scor-Tape since it’s a strong adhesive. The sentiment is from Shoe Wardrobe 2d. Ed. Outline and was stamped with VersaMark ink and heat embossed with Liquid Platinum Embossing Powder. I attached the white cardstock to kraft cardstock cardbase. Such a clean and simple card but still a beauty. It’s hard to tell in the picture, but I finished off the blue frame with some Zig Wink of Stella Glitter in clear. I didn’t want to add any other embellishment or sequins because the center piece is the focal point. My second card is a shaker card. 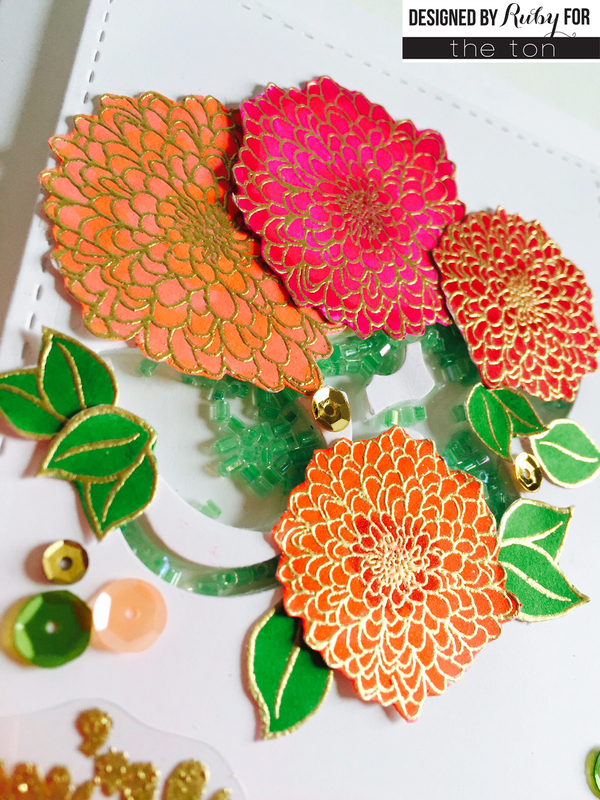 I stamped the flowers and leaves from Simple Florals with VersaMark ink and heat embossed with gold embossing powder. I used the Zig Clean Color Real Brush Pens in pink, orange, and red shades to color them. These are GORGEOUS brush pens. I did not use watercolor paper so I didn’t need to add any water to it for blending. I liked them as they were. For the leaves, I used a green color. It’s hard to see in the pictures but I used one of the dies from Papertrey Ink’s Doodlie-Do Die Collection for the center. I filled the shaker with beads in Lime as ‘leaves.’ I fussy cut and arranged the flowers and leaves around the shaker area. 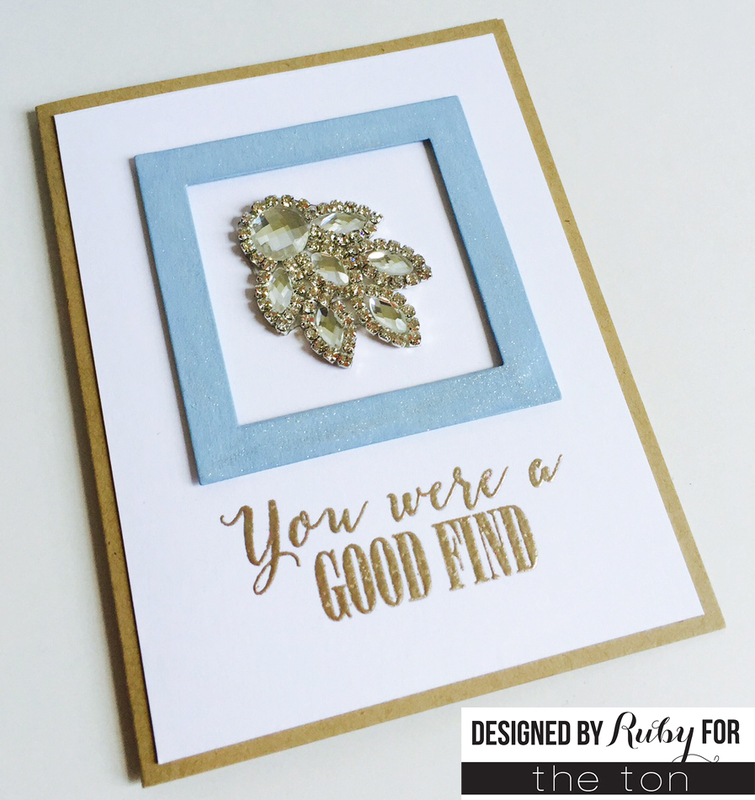 The sentiment is from Friggin Fabulous and was stamped with VersaMark ink on acetate sheet and heat embossed with Ranger Gold Tinsel Embossing Powder. Due to inky fingers, I messed up on the bottom of my card so I decided to shade it with a pale pink ink and glued down the sentiment over it. I finished it off with some sequins from Cinderella’s Ride Couture Mix. The shaker piece was attached to a white cardbase. My third card took me some time, but I think it was totally worth the effort. 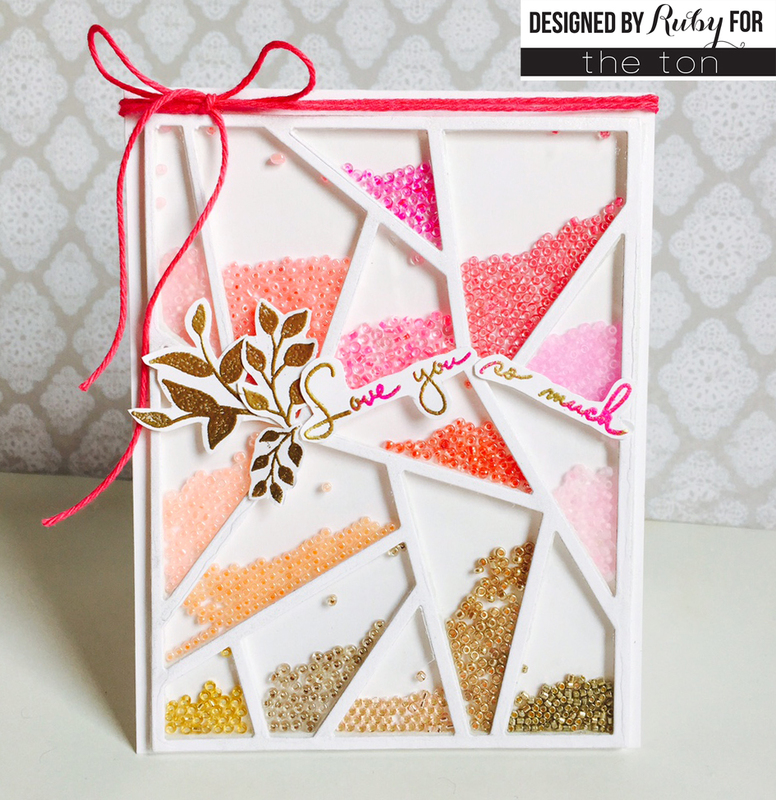 I wanted to make a shaker card using a cover plate die so I used MFT’s Die-namics Abstract Cover Up and die-cut white cardstock and white foam. 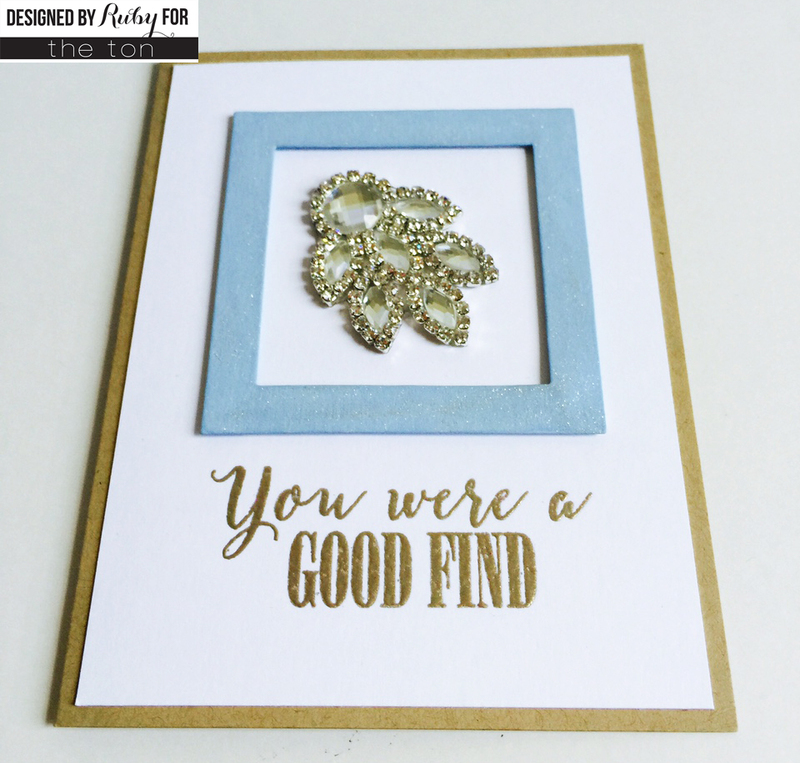 Recently, I switched from using foam tape to fun foam because the finished cards remain sturdier and the embellishments don’t stick to it. I removed the negative pieces and added a piece of acetate sheet between them with glossy accents. I turned it over and started filling in the empty areas with some of the new beads in shades of pink, peach, and gold. Once all the areas were filled, I added glossy accents to the outlined areas and attached my card base over it… yep, I guessed it and I did pretty well! I added some pink twine to the top part — it looks darker in the picture for some reason. The sentiment from It’s Cray Cray was stamped with VersaMark ink and heat embossed with gold and pink embossing powder to match the beads. 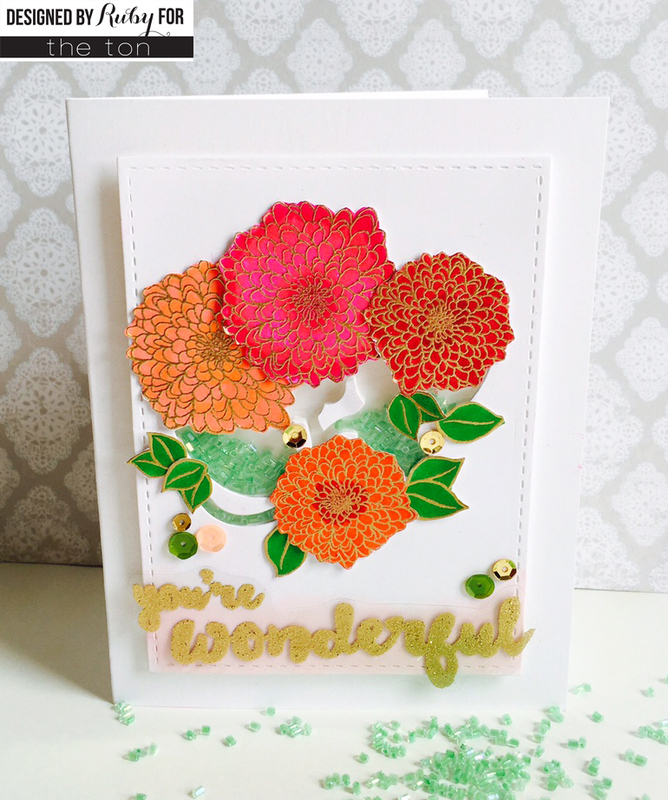 I stamped the leaves from Wild Peonies and Mini Wild Florals with VersaMark ink and heat embossed with gold embossing powder. I fussy cut the sentiment and leaves and attached them to the front with glossy accents. 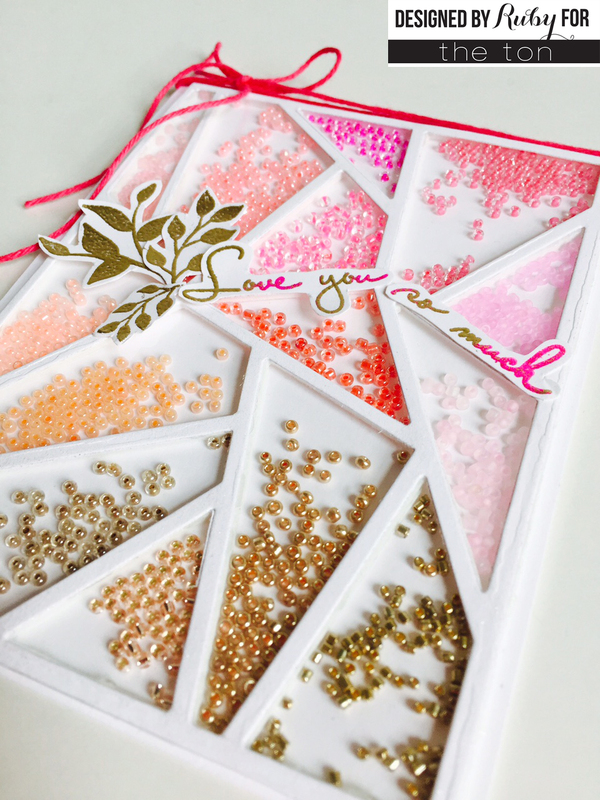 I used the following colors for this card: Clear Fuchsia, Clear Hot Pink, Clear Pink Coral, Pink Pearl, Bubblegum Matte, Light Pink Matte, Cherry Pearl, Pink Peach Pearl, Pink Peach Matte, Light Peach Pearl, Bright Gold, Hazelnut Mousse, Rose Gold, Light Rose Gold, and Nugget. P.S. My top 5 favorite beads are the following: Clear Hot Pink, Ultramarine, Mint, Light Peach Pearl, and Lemon Tart. **Note: If links do not work, please be patient. I will try to update them later today. All LOVELY cards as usual Ruby! That first one is a fabulous take on the challenge photo! Thanks so much for joining us on the Runway!!! Wonderful cards! The shaker card is AMAZING! Amazing cards! Love the gilding and that second card with all the flowers is just amazing, so much great dimension and I love the flowers! That shaker card is amazing! I love all your cards…but the flowers are wonderful! Beautiful cards! LOVE those gorgeous flowers in the yummy colors! Wonderful cards! You are so talented! Wowsers, my friend! Awesome cards, especially that last one! Amazing cards! I love the segmented card with all the different bead colors. I love all your cards!! !